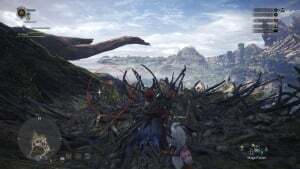 Sunkissed Grass is an Account Item in Monster Hunter World (MHW). These items do not appear in your Item Pouch, and are used for Resource Points instead. A special plant from the Ancient Forest. Know to cure all types of diseases. 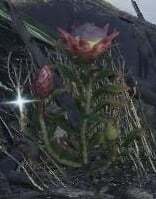 This item can be obtained by finding the unique gathering point spawning only during "Flourishing: Flower Beds" in the Ancient Forest. 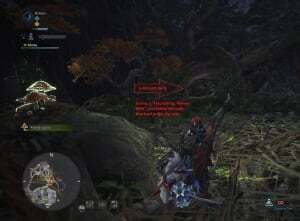 Gathering it for the first time will unlock the Sunkissed Grass ingredient at the Canteen. then walk to the rock with a Mandragora mushroom on it, and turn your camera to face north. you should now see a small gap you can crawl under, created by an arching tree/root. about 1 foot to the right of the small orange tree. follow it up past the adamant seed and swing on the vine. it will be just in front of you. After going through the opening, follow the path to the right where it will start going upwards. Keep following it strait upwards and you will come to a gap where you have to vine jump across. You will land in the nest with the flower on the far side of it.